The summer bride is lucky - summer wedding flowers are as varied and vibrant as the rainbow, so choosing the blooms for your bouquet and other wedding flowers is truly an adventure. Summer is when most of the traditional, romantic flowers such as roses are in bloom, as well as a grand assortment of tropical flowers from around the world. The most difficult part of picking flowers may be narrowing down your choices! Most summer weddings call for bright, vibrantly colored flowers rather than pastels, which are usually the most popular at spring weddings. Your personal preference and the colors you've chosen for your wedding party and the decor should, however, be the most important considerations when choosing your flowers. Casual or Formal Summer Wedding Flowers? Will you be getting married on the beach, in a garden or in a cathedral? Will the wedding be in the evening or afternoon? All of these factors will influence your choice of flowers. More informal, afternoon weddings can be accented by an array of wildflowers and bold, cheerful bouquets containing daisies, sunflowers, Queen Anne's lace and other hardy blossoms. Generally, a wildflower bouquet will have a mix of several different flowers, but you may want to select one as the feature flower. 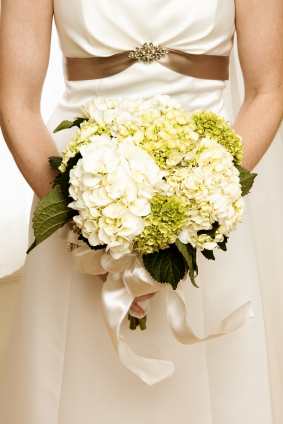 Hydrangeas are lovely for country or garden weddings, as are sweet peas and snapdragons. For a more formal bouquet, you'll want to focus on just one or two flowers that can be showcased for their elegance. The most traditional summer wedding flowers have always been roses, and in the hot months of summer you can find them in every color imaginable from deep crimson to pure white. Unusual shades such as orange and lavender are gaining popularity with many brides. Also traditional in many bridal bouquets are flowers such as stephanotis and freesia, both of which are popular for their rich scents as well as their beauty. Lilies are also considered very formal flowers. One of the most stunning formal wedding bouquets you can have is an arrangement with nothing but calla lilies. 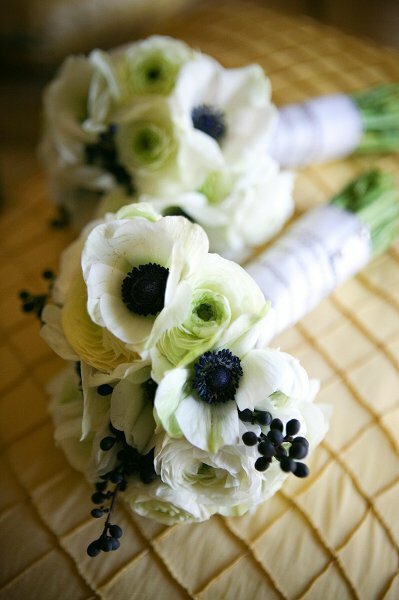 These sleek, simple flowers have a modern elegance that is ideal with a more contemporary wedding gown. 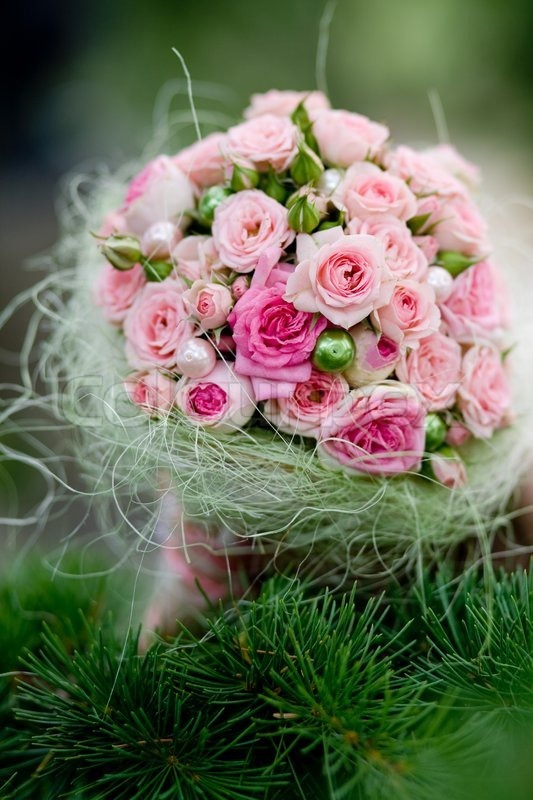 In fact, a bouquet that features just one flower of any kind, such as roses all in one color, is quite elegant. If you want your summer wedding flowers to be truly stunning, consider going with tropical blooms such as rare orchids, ranunculus or peonies. These flowers can add exotic appeal to your floral arrangements. Coordinating your flowers to the key colors of the wedding party and your décor is always the first step. After that, you'll be able to find an impressive selection of flowers in almost any color during the summer months. You can choose a few different colors for bright, high contrast bouquets or if you have two colors you wish to highlight equally. 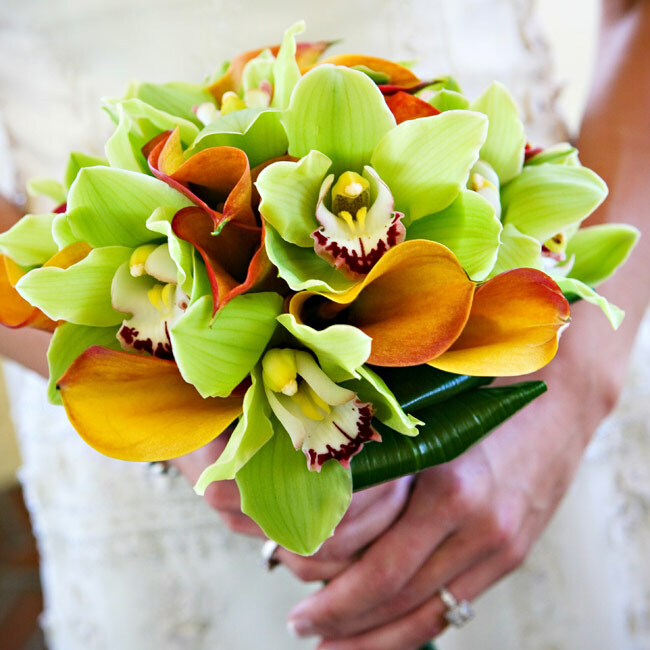 For instance, red roses with a selection of white flowers or an arrangement that features the soft green of cymbidium orchids with orange calla lilies both feature contrast. On the opposite end of the spectrum, you may decide you want your flowers to be monochromatic, featuring various shades of one color. Both purples and blues are wonderful choices if you want a bouquet that has an array of shades. Purple roses, anemones and blue hydrangea combine for a mix that goes from pale blue to deep purple in stunning fashion. The most traditional summer wedding flowers, as they are for all seasons, are pure white or ivory bouquets for the bride herself, while the bridesmaids can carry bouquets with a touch of color to coordinate. If you choose white or ivory summer wedding flowers, the choice of blooms is virtually unlimited. To add some definition, remember to add a bit of greenery for depth. 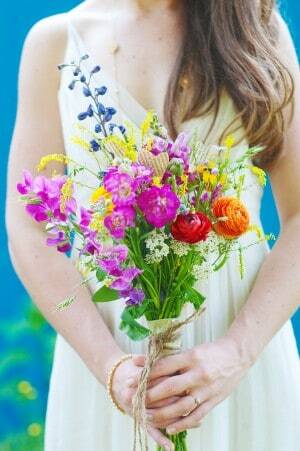 Whatever you choose for your summer wedding flowers, consider ordering silk bouquets for even more versatility. Today's silk flowers are so real, many people don't realize they aren't the real thing. Summer weddings can mean sweltering heat, and silk flowers don't need water and won't wilt no matter how long the celebration lasts! 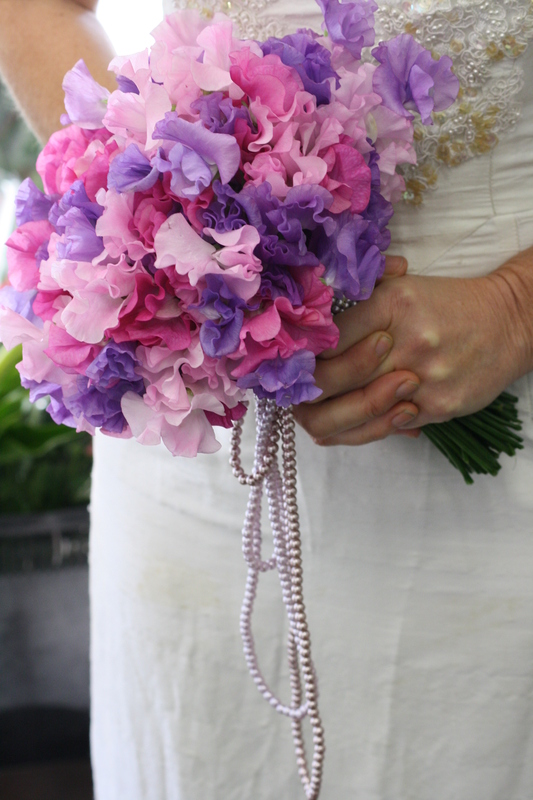 Your silk summer wedding flowers will also be a lovely keepsake you'll treasure for years to come.